A major obstacle to improving Army readiness is the inability of units to have everyone on their rosters ready to deploy together, Sgt. Maj. of the Army Daniel Dailey says. 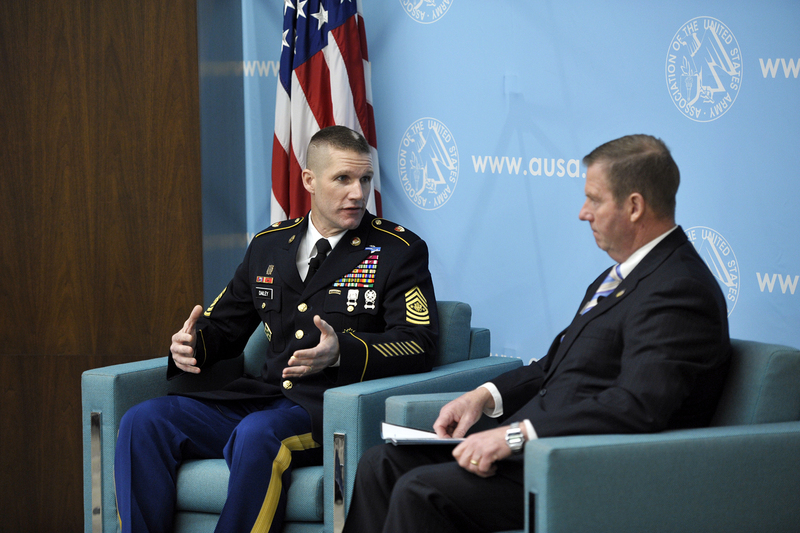 A large part of that problem is simply that so many soldiers are detailed to myriad other missions at any given time as end strength has steadily declined in recent years, Dailey said Feb. 14 at a breakfast forum hosted by the Association of the U.S. Army’s Institute of Land Warfare. Another issue is that many soldiers are rated as nondeployable for various administrative and medical reasons, he said. Understaffing is an issue being addressed by a recent congressional decision to stop the Army’s drawdown and increase end strength across all components. Current plans call for growing the active-duty force to 476,000 from its present 460,000. In addition, the Army National Guard has authorization to grow by 4,000 soldiers, and the Army Reserve by 8,000. But it’s not about end strength alone, Dailey said. “We need resources,” he said. “We’ve got soldiers all over the globe, deployed in approximately 140 countries. We’ve got to continue to support not only them, but their families back home. “Over the last several years, that’s an area where we’ve been taking risk” in such budget accounts as base operations and morale, welfare and recreation programs, he said.